The original Japanese title of this film is "Ankokugai no Taiketsu." 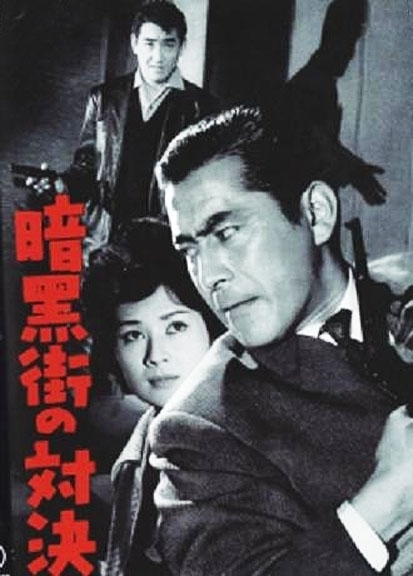 The legendary Toshiro Mifune portrays Fujioka, a detective facing corruption charges. As the story opens, he receives a demotion and gets reassigned to a crime-ridden district overrun by two notoriously violent and ruthless Yakuza clans: the Oka and the Kazuka. The Oka attempt to buy Fujioka off and recruit him as an ally against the Kazuka, but the detective befriends Murayama, a former Kazuka member hell-bent on revenge against the Oka for rubbing out his wife. Fujioka thus prepares to take on the Oka as adversaries. The tone of the film is (given its subject matter) somewhat atypical: light, playful and fun.